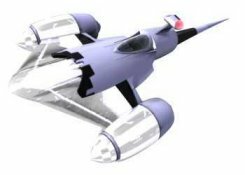 The baseline version of the N1 Starfighter, the Police Cruiser is outfitted for civil defense needs. Lacking the hyperdrive and advanced targeting sensors, the NX Police Cruiser is still more than adequate for the Naboo Constabulary's neesd. In the dark days of the invasion of Naboo many NXs were brought into military service, where they acquited themselves admirably against long odds. Still, if it weren't for the timely destructon of the Droid Control Ship, the Police Cruiser's sacrifices would have gone for naught. Can carry 2 proton torpedoes, but rarely does except in times of known hostilities.